Game master Ryo Bakura wants to use the power of his Millennium Ring to put the souls of Yugi, Jonouchi, Anzu, and Honda inside his "Monster World" miniatures forever. Now, with 10-sided dice in hand, Yugi and Dark Yugi must hack and slash their way their Bakura's adventure and defeat the Dark Master Zorc... or die trying! Then, on the island called Duelist Kingdom, a battle royale is taking place to determine the greatest "Duel Monsters" player in the world! A fight with fisherman Ryota Kajiki is just a warmup for Yugi, the only person who's beaten Kaiba, the former world champion. But although Kaiba may be in a coma, his deck still lives... in the hands of an evil ventriloquist, who has stolen not only Kaiba's deck but his very soul! 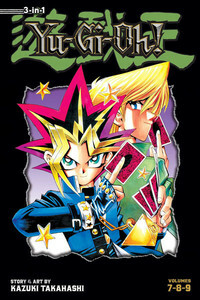 Collects volumes 7-9 in omnibus format. Story and art by Kazuki Takahashi.